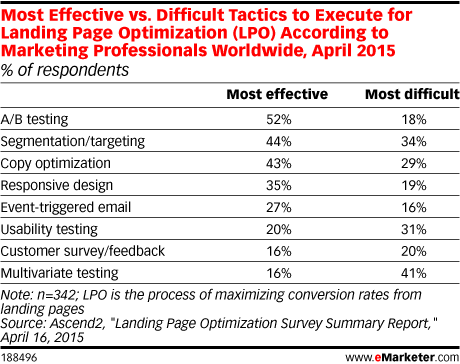 Data is from the April 2015 Ascend2 "Landing Page Optimization Survey Summary Report." 342 marketing, sales and business professionals worldwide were surveyed online in April 2015. Respondents identified their role within their company as CEO/COO/CMO/CSO, etc. (32%), marketing or sales staff (19%), sales VP/director/manager (6%), VP/director/manager (33%) and other (10%). Respondents identified their primary marketing/sales channel as B2B (74%) and B2C (26%). Respondents were from companies with more than 500 employees (18%), between 50-500 employees (22%) and fewer than 50 employees (60%).